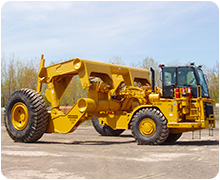 Kress Carriers are custom designed to suit the specific application requirements of our customers. Our products are engineered and constructed to deliver superior performance, outstanding reliability, and cost efficient operation. 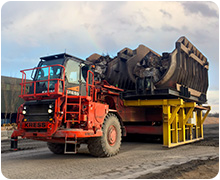 Kress is the leader in heavy duty material handling solutions with machines in operation around the world in some of the harshest environments. 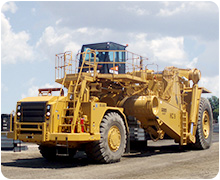 •	Most flexible Kress carrier with high utilization and availability for many operations. •	Able to transport scrap boxes, scrap buckets, liquid steel/iron, finished/semi-finished products and other products/materials as needed. •	Simple, robust design for long life. 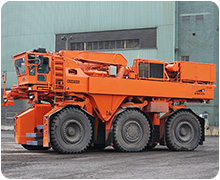 •	Available in capacities up to 400 tonnes. •	Able to pick up cold or red hot stacks of slabs from the ground or directly off of the continuous caster. •	Capable of stacking and sorting slabs in even the highest density slab yards. •	Self-loading carrier with excellent flexibility and maneuverability within the slab yard or caster area. •	Articulated steering system for an extremely maneuverable machine. •	Extremely high tonne kilometer per hour capabilities. •	Excellent maneuverability for precise ladle positioning. •	Ground, stand or transfer car pick-up for maximum utilization. •	Available with a ladle lid holder to retain the heat of contents during transport. •	Available in capacities up to 500 tonnes.